High-security wheel blocking. 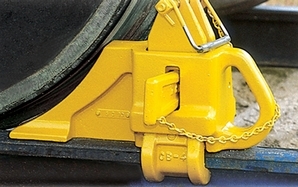 Clamps grip rail head through wedge action. Do not use for impact stopping. Use one chock at each end of the car. • For rails 60-104 lbs. • Use on flat track.